Roll puff pastry to 3-4mm in thickness. Allow to rest for 20 minutes. Cut into a round tart 15cm in diameter. Rest until required. Cook beetroot then cut into evenly sliced pieces. Blend half of the goat’s cheese in the blender with a little olive oil to make a smooth paste. Arrange the slices of beetroot neatly on the tarts. Finish with the rest of the goat’s cheese broken in to nice piece and cook in the oven for a further two minutes. 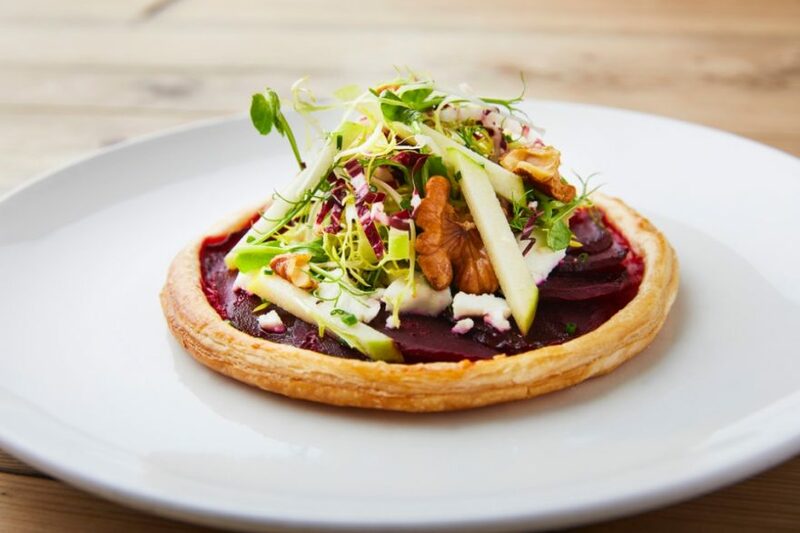 Combine the toasted walnuts, apple, frisée, pea shoots, olive oil and seasoning and dress tart. Serve immediately with a delicious glass of Gruner Veltliner. Beehive Gift Vouchers make an ideal present for Christmas or any occasion throughout the year. For more information ring 01628 822877 or click here.